At Wales Ape & Monkey Sanctuary we have many donkeys and mules. All have been rescued within the UK. There are estimated to be 50 million donkeys (Equus asinus) and as many mules worldwide. They can be used for such applications as riding, driving, flock protection, companion, breeding, and training calves. Donkeys and mules are not small horses. They have anatomical and physiological differences compared to horses and their care requires special consideration. Structural differences compared to horses mean that they require specialized tack and harness for riding and driving. Donkeys, also called burros and asses, are found throughout the world. They are members of the Equidae family, which also includes horses and zebras. They look a lot like their cousins, but have long, floppy ears and tend to be stockier than horses or zebras. 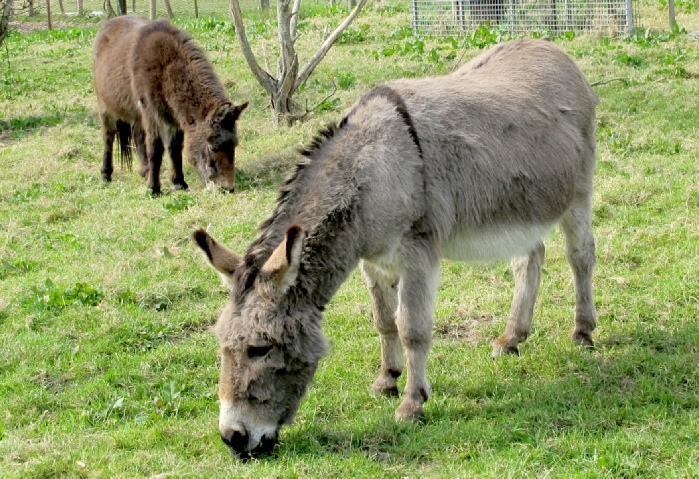 A mule is the result of breeding between a male donkey and a female horse. It is said to have the body of the horse with extremities of a donkey. Mules can range in height from 36 inches up to 17 hands, depending on the size of the mare and stallion used. We recommend feeding donkeys quality barley straw as it is high in fibre and low in sugar, and closely resembles the food that a donkey would eat in the wild. Click here to read about Pepe, Bonnie and their friends at the Sanctuary.